Socialisation is one of the key things that a well balanced puppy has to learn. This means giving the puppy lots of lessons, and gradually upping the anti. 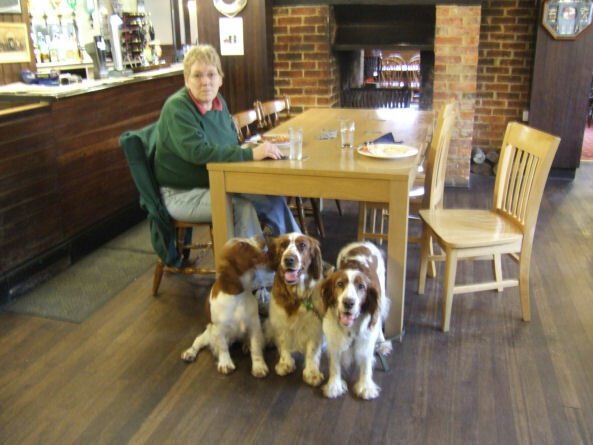 There are a number of suitable places and Anya has visited a variety including dog friendly pubs, supermarket car parks and farmers markets. We are very lucky that there are a series of farmers markets in Hampshire. The first farmers market we visited was a small one at the end of the day. Obviously a small puppy is a very big draw and you don’t want to scare them with lots of people coming to say “hello”. The second market was a much larger one, but again we chose to go at the end of the day. She said hello to more people and again had a lovely time. For Anya’s third visit to a farmers market, we went around lunch time when it was a lot busier. Anya (and her mother and great aunt) had a wonderful time meeting lots of people. 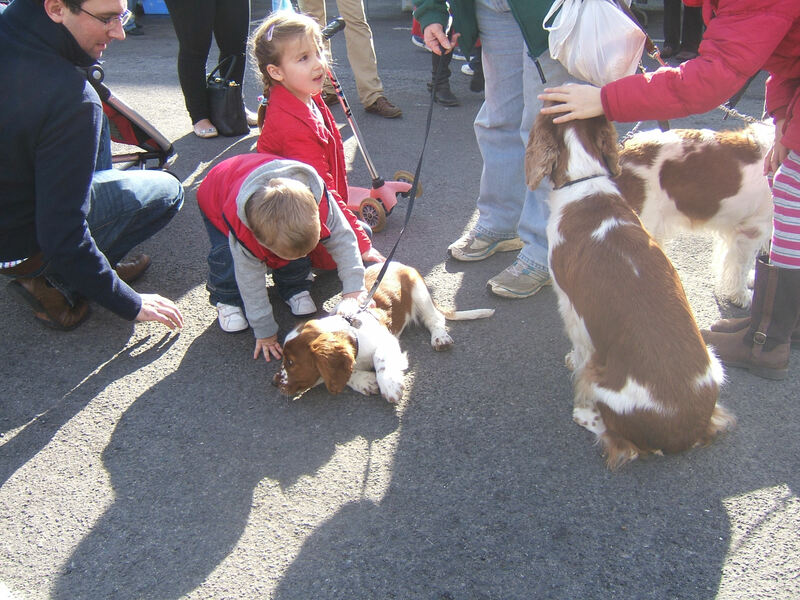 It was lovely to see how many children have been taught to ask permission before stroking a dog. It was also interesting that many adults didn’t show the same respect for them. One of the stall holders remarked how much she had grown since her first visit to the market and how much more confident she was – all a result of the hard work that we have been doing with her. One important thing to remember is that meeting people is hard work for a puppy. It is very important to ensure that they get a break when they are tiring. After this break, Anya was more than ready to meet her public for a few more minutes before we came home and she crashed out. Why is my 7 month springer tearing my plants up? I find it interesting looking at the search terms that people use to find my blog. Today, there was a more descriptive one than most – “why is my 7 month springer tearing my plants up”. Because he can– Puppies spend their time finding out about the world around them. They pick up leaves and sticks, they want to see if they are edible or what the purpose of them is. 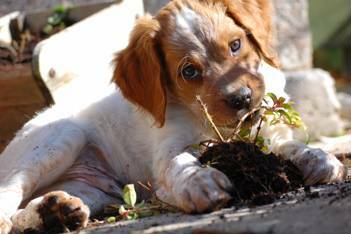 Digging up plants is (to the puppy) the natural extension of picking up a leaf. The key thing is to ensure that your puppy understands that he should not do this and respects your authority over the garden. The first thing to do is to make sure that your puppy fully recognises what is expected of him indoors and then move on to outdoors. The article on Whose Garden is it? may help you with this. Because he thinks it is fun – If you turn the retrieval of a plant into a game (in the puppy’s eyes) by chasing after him to retrieve the plant, then you are undoing much of the training you have already put in. Do not allow this to happen. Often the best thing to do (assuming the plant is not poisonous) is to remove yourself from the garden. If you have worked hard with your puppy to ensure that you are the light of his life then he will quickly come looking for you. If he doesn’t, try distracting him with one of his favourite toys and then quickly remove the plant. Because he is bored – Puppies need lots of stimulation. If you don’t provide it, they will go looking for things to do. There are lots of things that you can do to keep your puppy’s mind busy and not all of them require mountains of exercise. (A good thing since puppies should only have a daily 5 mins exercise for each month of their age to ensure there is no undue pressures on their growing bones). Our 3 month old puppy has been to farmers markets, supermarket car parks, pubs, schools at going home time – all places where she sees and experiences lots of people and things going on without having to walk far. Build it up gradually so as not to frighten them. 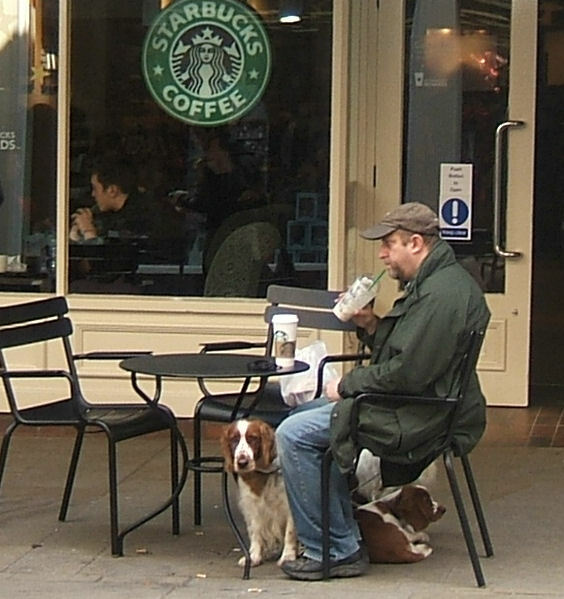 Eventually, as an adult, they should be able to go into a city centre on a Saturday afternoon and enjoy their afternoon out as much as the humans with them. It should be said that these comments apply to all breeds, but there is little doubt that springers can be a little more energetic than some breeds! PS – it should be noted that the photo above was provided by a friend of mine! I should have got round to this before, but having a litter of puppies means that things are fairly hectic and after they go to their new homes, it takes time to get back to some semblance of normality. Anyway, I would like to introduce you to our new puppy – Anya. Anya is now three months old. It is my intention to follow her in this blog as she grows up and eventually gets introduced to the garden. As you can guess, it is pretty hard to get a young puppy to keep still for a photo, but she managed it for a second. At the moment her outdoor excursions in the garden are restricted to the puppy playpen. There is no way that I would leave her loose in the garden. There are far too many places where she could hide and maybe cause mischief. The main lessons that she is currently focusing on can be divided into two very broad categories, socialisation and training. These lessons will be subjects for future blogs. Socialisation is a very important one. In these early days, puppies get the foundation ideas about how they see the world, so it is important to introduce them to a wide variety of experiences without “over-facing” them. Vaccination programmes these days meant that Anya was able to go out into the outside world at 10 weeks. This meant that there was less time than in the past to keep her occupied with new experiences at home and her education could start earlier. The puppies introduction to the world started with visitors after Christmas. Now at seven weeks old, we increased their exposure to new things by having workmen in the house drilling and banging around.